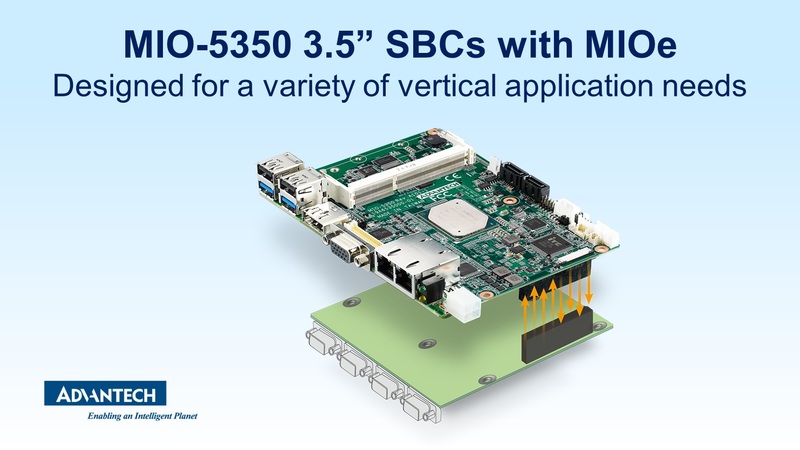 Advantech, a leading embedded computing and intelligent applications provider, today announces the release of MIO-5350, a 3.5” fanless SBC that supports the latest Intel® Pentium®N4200/ Celeron® N3350/ Atom E3900 series low power consumption processors with a TDP of only 6W~12W. MIO-5350 provides 40% CPU performance enhancement and 46% graphic performance boosts compared with previous generations. It offers 4K2K graphics and three simultaneous displays through HDMI/DP, LVDS/eDP, and VGA interfaces. MIO-5350 comes bundled with Advantech’s exclusive iManager APIs, utilities, and WISE-PaaS/RMM – a cloud ready solution for remote device management that brings the benefits of cloud computing within the reach of many embedded application developers. MIO-5350 is designed to fulfill a variety of vertical application needs. It adopts a rich array of I/O interface including: dual LAN ports, 2 x USB3.0, 4 x USB2.0, 4 x COM ports, and 2 x SATAIII. For expansion, MIO-5350 supports 1 x M.2 (key-E), 1 x full-size MiniPCIe (mSATA), and MI/O Extension (MIOe). These allow various peripherals modules like WiFi, 3G/LTE, storage, and I/O expansion (EXM and MIOe) to expand functionality. MIO-5350 can operate under wide temperature settings ranging from -40~85 °C, making it an ideal solution for use in rugged and harsh environments such as factory automation, railways, and outdoor signage and kiosks (wide temperature SKU schedule to phase in in 2018 Q2 ). Based on Intel Gen 9 graphics engine with up to 18 EUs, MIO-5350 provides improved throughput and media acceleration for DirectX 12.0, OpenGL 4.3, and OpenCL 2.0 Full Profile. Through its rich display interfaces such as HDMI1.4b/DP1.2, LVDS/eDP1.3, and VGA, it can support up to 4K2K resolution and three simultaneous, independent display outputs, which satisfies the need for high-quality and intense display applications. MIO-5350 is noteworthy for its combination with Advantech’s WISE-PaaS/RMM solution. WISE-PaaS/RMM is part of Advantech’s WISE-PaaS cloud solution, which focuses on remote device management and monitoring. WISE-PaaS/RMM provides centralized management features including HW/SW status monitoring, remote control, and system backup/recovery. It supports server redundancy and hierarchical server management, which increases service reliability and availability. WISE-PaaS/RMM utilizes standard IoT protocols, like MQTT from IBM, to communicate with IPCs and IoT gateways and sensors. It provides a WISE Agent framework for data acquisition from devices, as well as the RESTful API web service, which allows the user to integrate RMM functions with other applications or make further customizations. WISE-PaaS highly enhances connectivity for hardware, software, devices, and sensors, and helps customers to transform their business by incorporating powerful IoT cloud services.